The U-2 is a jet-powered reconnaissance aircraft specially designed to fly at high altitudes (i.e., above 70,000 ft [21 km]). It was used during the late 1950s to overfly the Soviet Union, China, the Middle East, and Cuba; flights over the Soviet Union, the primary mission for which the plane was designed, ended in 1960 when a U-2 flown by CIA pilot Gary Powers was shot down over the Soviet Union. This event was a major political embarrassment for the U.S. A redesigned version of the U-2, the U-2R, was used from the late 1960s through the 1990s. The U-2R was used extensively during the Gulf War of 1991, for example, to monitor Iraqi military activities. A more recent version of the U-2, the U-2S, is deployed today. The U-2S has been used recently by both the United States and United Nations weapons inspectors to make observations of North Korea and Iraq. Background. Shortly after the end of World War II, the tenuous alliance between the Soviet Union, the United States, and the nations of Western Europe ruptured. The Soviets took control of Eastern Europe, the North Atlantic Treaty Organization (NATO) was formed by the U.S. and its European allies, and the Cold War began in earnest. Tensions were high, and war between NATO and the Soviet Union often seemed imminent. Military planners desired what they termed "pre-D-day intelligence" about the Soviet order of battle, that is, information about the Soviet military obtained before a war began. Spy satellites would not become available until the early 1960s, leaving aircraft as the primary means of obtaining up-to-date information about Soviet military and industrial activities. A number of photographic spy overflights of Eastern Europe, the Soviet Far East, China, and the periphery of the Soviet Union were made in the late 1940s and early 1950s using various U.S. and British aircraft including the RB-29 bomber, the B-47B bomber, the RF-80A fighter (the first operational U.S. jet fighter), the RF-86F fighter, and the RB-45C reconnaissance aircraft. None of these planes had enough range to penetrate very far into Russia itself, where nuclear testing grounds and missile bases were located; nor could they fly at altitudes high enough to avoid interception by Soviet MiG jet fighters. By the mid-1950s, Soviet air defenses had improved to the point where overflights by available aircraft had become impractical. Development of a lightweight, high-altitude, single-pilot plane (originally dubbed the CL-282 but later the U-2, a deliberately misleading designation suggesting a "utility" aircraft) began in 1954. However, the plane could not ready until 1956; in the meantime, high-altitude, unmanned balloons were used to carry camera packages over the Soviet Union. These balloons, codenamed Genetrix balloons, were launched in Norway, Scotland, Turkey, and West Germany, from whence they were carried by global tradewinds across the Soviet Union to recovery zones over the Pacific Ocean. Some 379 Genetrix balloons entered Soviet airspace in 1955 and 1956; 235 were shot down by MiGs or antiaircraft guns, and only 44 were recovered. The success rate would have been higher except that President Dwight Eisenhower had ordered that the balloons not fly at their true maximum altitude (70,000 ft [21 km]); he reasoned that if the balloons were restricted to an altitude ceiling of 55,000 ft (17 km), where the Soviets could shoot them down most of the time, the Soviets would not be motivated to develop high-altitude interceptors that could be later used against the U-2. 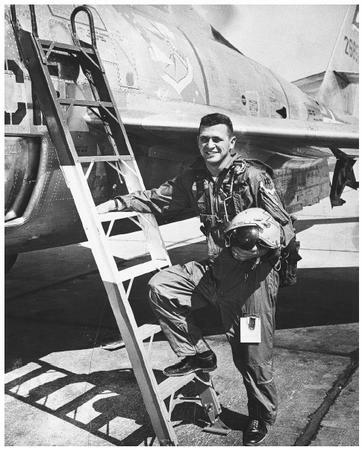 Gary Powers, shown while an Air Force Reserve pilot, later flew an American U-2 spy plane over Russia in 1960 and was shot down, held prisoner, was subjected to a public show-trial, and ultimately returned to the West in exchange for a Russian spy. Design. The U-2 is built much like a glider, with ultralight construction and long, narrow wings that measure 80 ft (24 m) from tip to tip, longer than the plane itself. (The U-2C, first flown in 1978, has a wingspan of 103 ft [31 m].) Wings of this type, mounted at right angles to the body of an aircraft, provide high lift (i.e., upward aerodynamic force resulting from airflow around the wing); this is necessary at 70,000 ft because the atmosphere is so thin. The U-2's cruising altitude takes it so close to outer space that the sky above appears black and the curvature of the Earth is visible. The U-2 had other features intended to reduce its weight and thus increase its cruising altitude and range. The wings were bolted to the body of the aircraft rather than supported, as in standard jet aircraft of that period, by a spar running right through the fuselage. The tail assembly was held on by only three bolts; the skin of the fuselage was thin aluminum; flight controls were manually powered, so the pilot flew the plane by muscle power; and there was no radar. In-line "bicycle"-type landing gear was employed, consisting of a main unit under the plane's nose and small wheel at the tail; upon landing, the U-2 would taxi to a halt and then tip over onto one wing. For takeoff, small detachable supports or "pogos" held the wings off the ground and were dropped when the plane was airborne. A camera package termed the A-2 was installed in the aircraft's belly; it contained three still cameras, one pointing straight down and the other two pointing to the left and right of the aircraft's direction of travel, as well as a tracking camera that filmed a continuous record of the plane's mission. Development of the U-2 and of reconnaissance balloons required numerous test flights over the United States. The balloons were often visible from the ground as metallic-looking ellipses, and prototype U-2 planes were sometimes spotted from civilian airliners; these sightings giving rise to many reports of unidentified flying objects (though to be alien spacecraft). Because the devices actually causing the sightings were secret, the government offered often uncreditable explanations for the sightings, inadvertently helping to encourage bizarre UFO beliefs. Because of the need to fly light, the U-2 does not carry weapons. Nor can it undertake evasive maneuvers if fired upon, for it is delicate, and breaks up if subjected to strong forces. It is designed to fly high and far. Deployment. On June 20, 1956, the first U-2 flight over a "denied area"—Warsaw Pact airspace—was made. The flight passed over Czechoslovakia, Poland, and East Germany. On July 1956, flights over the Soviet Union itself commenced, with a flight over Leningrad to photograph the shipyards. MiG fighters attempted to intercept the U-2, which was detected by Soviet radars, but were unable to attain its altitude. The next day a U-2 overflew Moscow itself, photographing the Kliningrad missile factory and Khimki rocket-engine factory north of the city. Although the U.S. did not officially admit the existence of the U-2 flights, due to Soviet diplomatic protests President Eisenhower ordered all U-2 overflights of the Soviet Union temporarily suspended late in 1956. U-2s were used during this interval to spy on French and British actions in the Middle East during the Suez Crisis. Eisenhower ordered U-2 flights resumed after the Soviets crushed the Hungarian rebellion of October 1956. This Soviet aggression heightened tensions between NATO and the Warsaw Pact and increased the U.S. desire for intelligence data. Over the next few years, the U-2 was flown over China and Vietnam as well the Middle East, Eastern Europe, and the Soviet Union. On May 1, 1960, a U-2 was shot down over Russia by a surface-to-air missile. The pilot was captured, tried for espionage, and sentenced to 10 years in prison. (He was traded for a captured Soviet spy two years later.) No more overflights of the Soviet Union were attempted. Coincidentally, however, the U.S. spy satellite program accomplished its first recovery of a film packet from space on the day that Powers was sentenced (August 19, 1960). The U-2 was, therefore, no longer a unique source of intelligence about affairs inside Soviet territory. However, it still had an important role to play in military history. On October 14, 1962, a U-2 flying over Cuba took pictures that proved that the Soviet Union had established sites for launching medium-range ballistic missiles in Cuba. The presence of these nuclear-armed missiles in Cuba, combined with U.S. insistence that they be removed, gave rise to the Cuban Missile Crisis, which almost resulted in war between the U.S. and Soviet Union in October 1962. Despite radical improvements in spy satellite capabilities since the 1960s, U-2 planes continue to provide some intelligence data. Some experts believe that U-2S photographs of North Korean facilities were the basis of the U.S. discovery in October 2002 that North Korea was producing enriched uranium for nuclear weapons. In 2003, proposed U-2S overflights of Iraq to support United Nations weapons inspections were a subject of controversy between the U.S. and Iraq. Furthermore, a civilian version of the U-2, the ER-2, is used by the U.S. National Aeronautics and Space Administration for Earth-resources research. The ER-2 has even made flights over Russia—with official permission. Peebles, Curtis. Shadow Flights: America's Secret Air War against the Soviet Union. Novato, CA: Presidio, 2000.